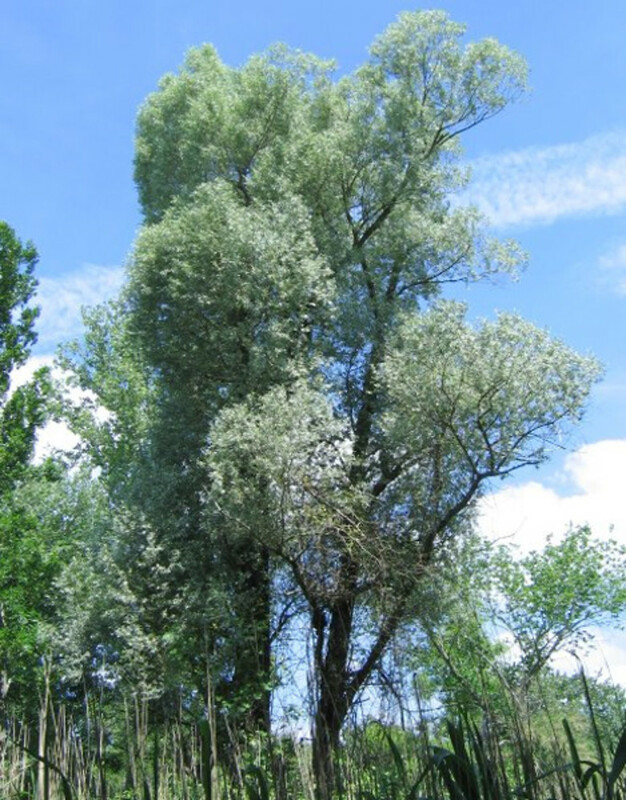 White willow is so-named for its long, tapering leaves which are downy white on the undersides. Its bark is yellow and ridged. The branchlets are brittle and break easily, sometimes leaving a litter of fallen twigs on the ground beneath the crown. 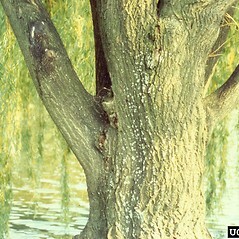 Weeping willow is a hybrid between this species and Peking willow (Salix babylonica). Golden weeping willow is another cultivar of this species that can grow very large and produce leaves that turn golden in the fall. 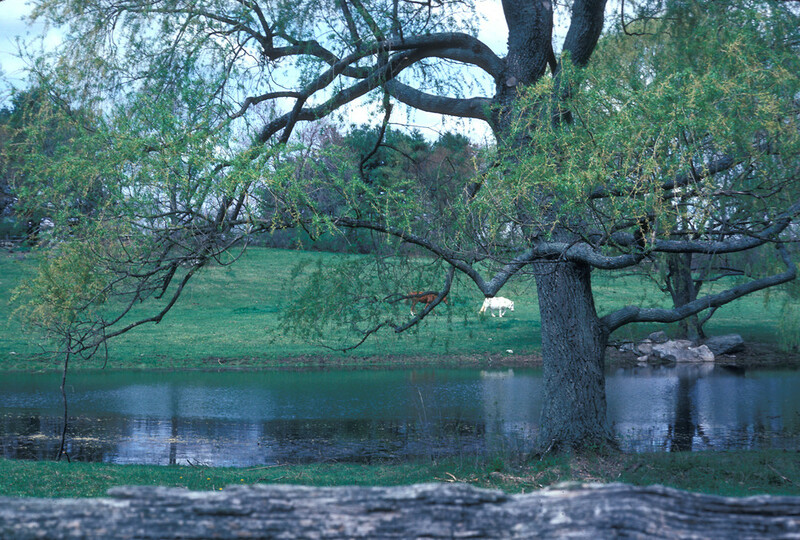 White willow is tolerant of wet soils. 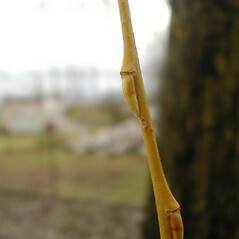 winter buds with a sharply pointed apex, the margins distinct and overlapping, leaf blades somewhat abruptly tapering to a long, thin apex, and branchlets flexible at base, tearing when bent to failure (vs. S. alba, with winter buds blunt at apex, the margins connate; leaf blades gradually tapering to the apex, and branchlets brittle at base, breaking +/- cleanly at the junction of yearly growth). 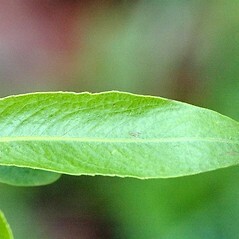 leaf blades green on the lower surface, with small, but evident, stipules at the base of the leaf stalk (vs. leaf blades with a whitish bloom on the lower surface, without or with minute stipules at the base of the leaf stalk). 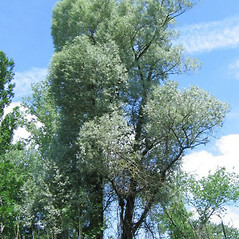 Salix alba L. ssp. caerulea (Sm.) 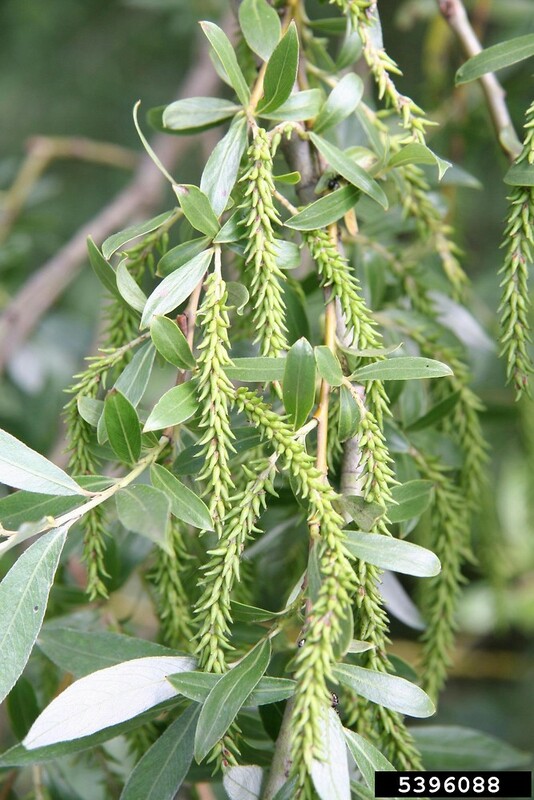 Rechinger f.
Salix alba L. ssp. vitellina (L.) Arcang. Salix alba L. var. caerulea (Sm.) Sm. Salix alba L. var. calva G.F.W. Mey. white willow. 1a. 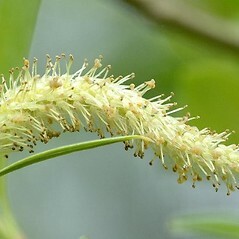 Salix alba L. ssp. caerulea (Sm.) Rechinger f.; S. alba L. var. caerulea (Sm.) Sm. ; S. alba L. var. calva G.F.W. Mey. ; S. alba L. ssp. vitellina (L.) Arcang. ; S. alba var. vitellina (L.) Stokes; S. vitellina L.; • CT, MA, ME, NH, RI, VT. Riparian forests, river banks, roadsides, field edges, wetland margins, near dwellings. 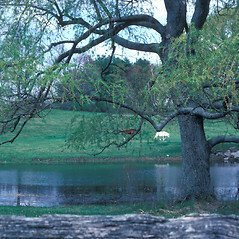 There are four forms of this willow that occur in New England. The “vitellina” form has bright yellow to bright orange-yellow winter branchlets and floral bracts commonly 3–3.5 mm long. The “caerulea” form has brown to green-brown winter branchlets, floral bracts 2.5–3 mm long, mature leaf blades often longer than 10 cm, 1.5–2 cm wide, and usually becomes glabrate on the abaxial surface. 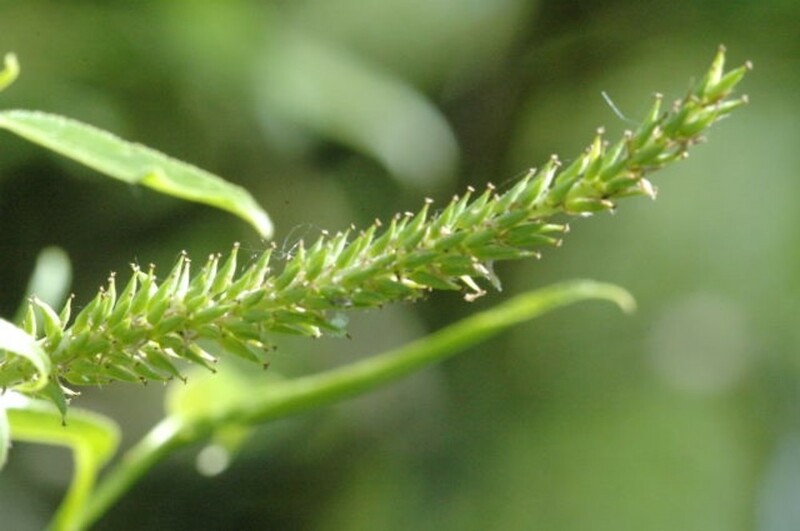 The “alba” form has branchlets and floral bracts similar to the preceeding, but has leaf blades 5–10 (–12) cm long, 0.5–1.5 cm wide, and often remain long-sericeous on the abaxial surface. 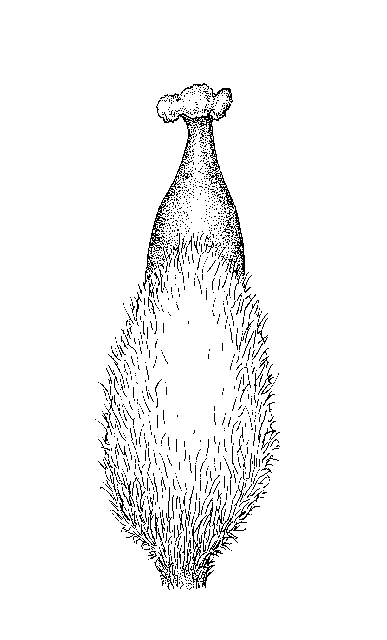 A fourth form, which may be referable to “micans” of Europe, is similar to the “alba” form but has the leaf blades densely and persistently long-sericeous with white hairs. These forms are regarded as valid infraspecific taxa in Europe (where they occur as natives; e.g., Meikle 1984) but are treated as cultivars by some North American authors (e.g., Argus 1986). Until the appropriate rank to treat these taxa can be determined, they are here recognized informally. 1×16. Salix alba × Salix lucida → Salix ×‌jesupii Fern. has been incorrectly called S. ×‌ehrhartiana by various New England authors (but that hybrid has S. alba and S. pentandra as parents and is not known to occur in New England). Salix ×‌jesupii is known from CT, MA, NH, VT. This hybrid is a tall shrub or small tree 4–8 m tall with abaxially glaucous leaf blades (rather than green and not glaucous in S. lucida) that show a mixture of white and red-brown hairs. The blades are mostly 2.8–4.8 times as long as wide (vs. mostly 4.2–7.3 times in S. alba). 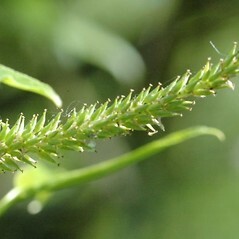 The staminate flowers have 3 or 4 stamens (rather than 2 in S. alba). 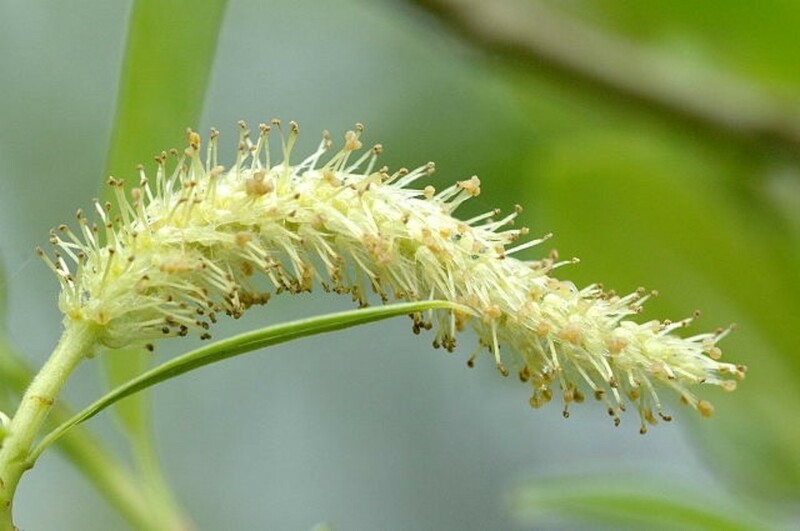 1×Salix babylonica L. Salix ×‌sepulcralis Semonkai is primarily responsible for reports of S. babylonica in New England, which is an Asian species that is not hardy in the northeastern United States. 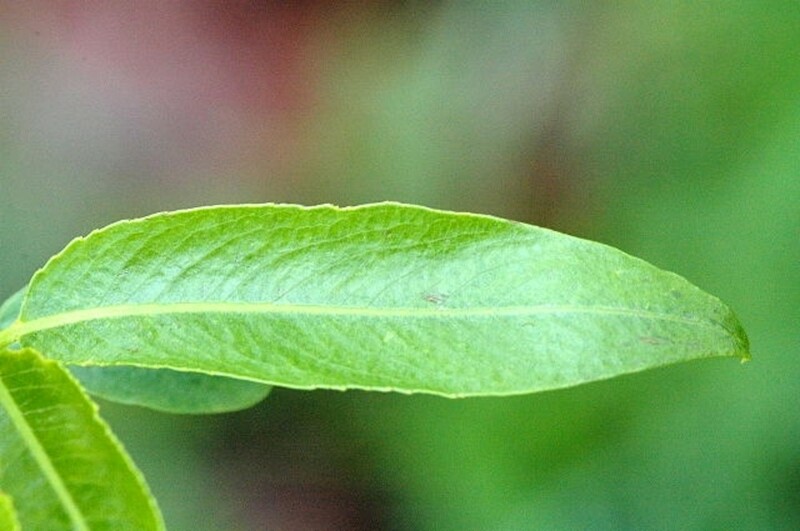 Salix ×‌sepulcralis is known from CT, MA, ME, NH, VT. It is recognized by its conspicuously pendulous branches and branchlets and gold-yellow (or less frequently green-yellow) branchlets. It is very similar to another S. babylonica hybrid in New England called S. ×‌pendulina; however, that nothotaxon has green-brown (or less frequently yellow-brown, gray-brown, or red-brown) branchlets. 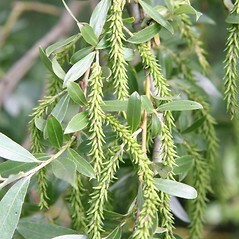 1×Salix euxina I.V. Belyaeva. 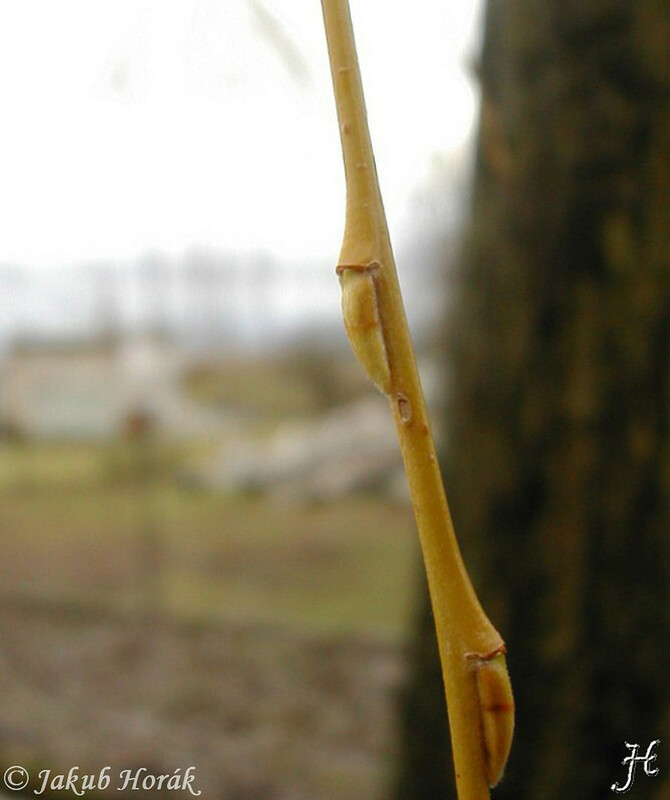 Salix ×‌fragilis L. [Fig. 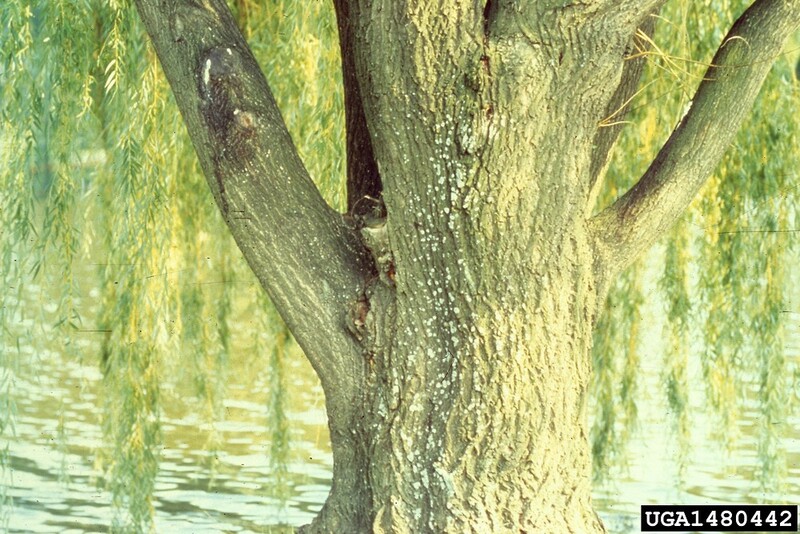 887] is a frequent willow hybrid known from CT, MA, ME, NH, RI, VT. It resembles S. alba but has sparsely pubescent to glabrous leaf blades, coarser, sometimes slightly irregular, teeth, and larger, asymmetrical stipules. From S. euxina it differs in its amphistomatous, usually abaxially sparsely pubescent leaves and relatively loosely flowered aments (leaves both glabrous and hypostomatous and aments relatively densely flowered in S. euxina). This hybrid, which is fully naturalized in riparian and lacustrine floodplains, is responsible for reports of Salix euxina in New England (note: S. euxina was formerly referred to as S. fragilis, and this hybrid was formerly referred to as S. ×‌rubens Schrank; Belyaeva 2009). The nothovarietal epithet “ basfordiana” applies to our material; however, the appropriate combination has not yet been made.